Daybreak provided the Wabbit and Lapinette with the perfect opportunity. 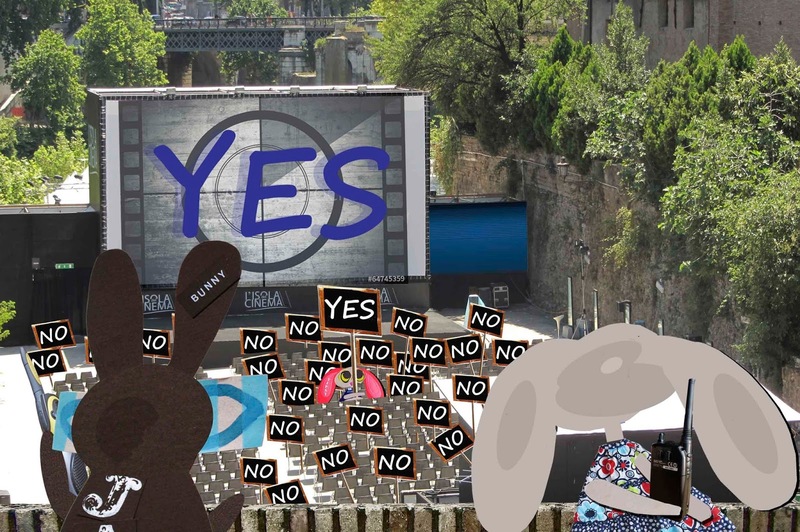 The No placards assembled for a rally and the Wabbit smiled wryly as they packed themselves in. He lifted his radio. "Whiskey Alpha Bravo to Control." Fitzy's voice crackled. "Copy." "Can you transmit some old, scratched film leader?" said the Wabbit. "Of course," said Fitzy; "Anything else?" 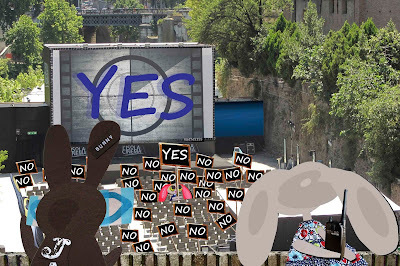 The Wabbit would have laughed out loud but for the circumstances. "That's a yes," he answered. The screen filled with a dusty image - and superimposed was the word 'Yes'. It appeared, faded, disappeared, then faded back, flickering like Christmas lights. The Wabbit nodded to Lapinette. She pressed a button on her radio. Security doors slammed down with an alarming crash. The Wabbit lifted a paw. Tipsy emerged from the midst, holding a giant placard. "Yes," she boomed; "Yes, yes, yes!" For a moment confusion reigned. The No placards looked at the screen because they didn't know where else to look. They were transfixed. The screen flickered Yes relentlessly. One placard muttered 'Yes?' in an uncertain fashion and a few others joined it. But most stared helplessly. "Can you see it?" yelled Tipsy. The placards shifted uneasily. "Mmm maybe," they murmured. "Then can you say it?" shouted Tipsy; "Can you say it, and say it loud?" "Yes!" chanted the placards. Tipsy hopped up and down. "Then my work is done."